As a gift to myself for finishing my MBA with a 4.0 average, I bought a new car stereo. A AVIC W8400NEX for the wireless CarPlay, capacitive touch screen, desire for a bit more audio fidelity than the Chinese model specific Android HU replacement, which I had used on a previous Range Rover. I didn't know much about CarPlay and I bet on it just because I am in the Apple EcoSystem and assumed it would be up to Apple's excellent standards. I didn't want a wired solution as I have a wireless charger in my car. You get in the car and about 10 seconds later the Wireless Apple CarPlay links up seamlessly after a painless configuration, which is the almost the same as pairing with bluetooth, perhaps even more painless when bench-marked against the previous OEM Entune Audio system. CarPlay syncs fast, and boots fast. Hiccups with Pandora at times and the maestro volume controls. 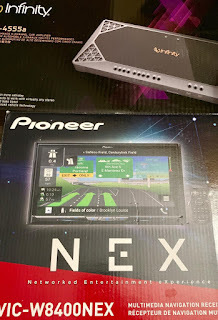 Integration with the w8400 is interesting but the fact is, it is notable that CarPlay runs as an AMP and not something that can run natively as well as anticipated. The pioneer should be a bit faster -- Apple CarPlay not the bottleneck in dealing with speed. Everything is fairly accurate and crisp, but perhaps not as detailed or fast as an iOS device. For example, it would be nice if Waze and Maps were slightly more detailed graphically. It'd really be nice to have some sort of information dashboard from CarPlay, tailored and unique. For example setting a background, having a notification type lock screen which informs you of snippets of information including weather, upcoming appointments, brief intro to last few emails and text. Apple, add a notifications screen just like the notifications section of an iOS device. Overall very nice, a few miscues and desire for more features but overall a solid base to build from and improve.